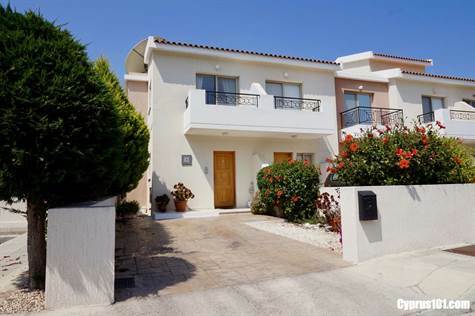 Tala Property, Paphos – This beautifully presented 3 bedroom semi-detached home is situated on a small complex of 12 in a quiet residential neighbourhood, within easy walking distance to Tala village amenities and the newly renovated village square. The main town of Paphos and the coast are a 10 minute drive away. The accommodation is spacious throughout with good quality finishes and includes many extras. The ground floor features an open plan living area with comfortable lounge, dining area and large kitchen, a guest toilet and useful storage cupboard. The fully fitted kitchen is well equipped with plenty of cupboard and worktop space. Appliances include built-in oven, electric hob and extractor fan, fridge/freezer and washing machine. A marble staircase leads up to three bedrooms and a modern family size bathroom. The master bedroom benefits from en-suite facilities and a private balcony with gorgeous sea views. Bedroom two, also with private balcony, has picturesque mountain views. The outside leisure space is designed to take full advantage of the wonderful outdoor life and includes a raised veranda with pergola and a beautifully landscaped garden with a wonderful variety of colourful shrubs and trees. An archway leads to the well maintained communal swimming pool and seating area with shower and toilet facilities to the side. A private driveway and second equally tended garden is situated at the front entrance of the property. Perfect as a permanent residence or holiday home, this property is certainly something special. It’s in immaculate condition and lovingly cared for. The furniture, blinds, curtains, light fittings and white goods are included and the property has full title deeds.